The new Bark River Knives Adventurer Neck Knife is very compact and easy to carry. The unique handle is ergonomic any way you need hold it and very secure in your grip. The handle has a relief for your thumb for use in a lateral hold for chores like skinning or cutting through a hide. As compact as the knife is, most people will still be able to have a four finger hold on the knife for most uses and the grooves on the top of the spine help locate the blade in the hand and also are handy for scraping a firesteel. 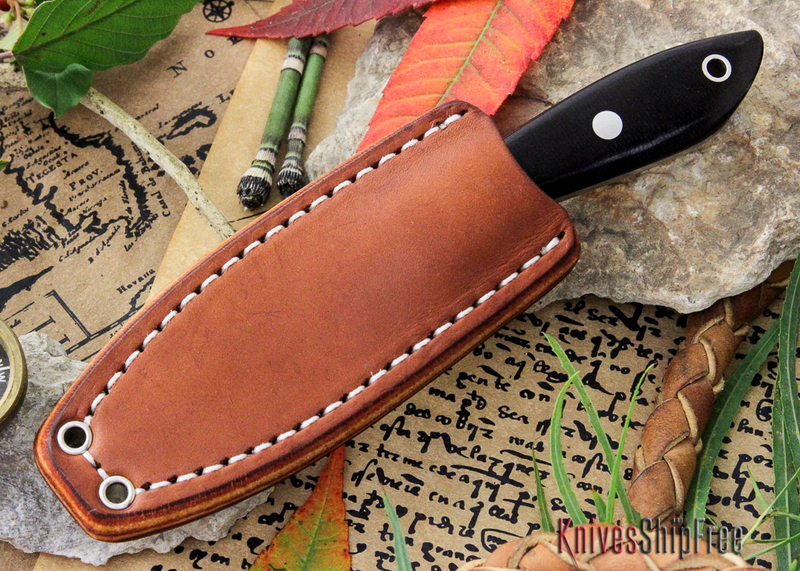 The Adventurer is the first knife that will use Bark River’s new Rare Earth Magnet Leather Neck Sheath. The knife is secure in the sheath when worn inverted and still easy to deploy and return to the sheath. The knife is feather light and will do the cutting tasks of a larger knife. You will find that the CPM 20CV powdered metal technology stainless steel is extremely fine grained and will take and hold a razor sharp edge. The Adventurer excels for fine work and performs very well for heavier cutting tasks when necessary. A special thanks to Murray Carter. This is an adaptation of one of his designs on a neck knife. Murray was kind enough to open his designs up to other makers in his excellent book on knife design, 101 Knife Designs.